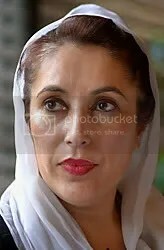 What’s up fam, for those that haven’t heard, former Pakistan’s former Prime Minister Benazir Bhutto was assassinated two weeks before before parliamentary elections where her party (Pakistan’s People’s Party) was widely expected to win the majority of the seats, making her Prime Minister. She was someone who truly believed in democracy. Politically, this is groundbreaking because Pakistan’s leader, Pervez Musharraf will rightly or wrongly be suspected of having his hand in allowing or ordering this attack to occur. No matter what, the US again pledges allegiance to an “ally” who really isn’t helping with the so-called war on terror and has a horrible record on human rights. Bush called on Musharraf to continue with elections. And what is Bush going to do if Musharraf doesn’t follow through? Nothing. Did I mention Pakistan has nuclear weapons? More importantly, Bhutto’s father was hanged, one brother dies mysteriously and her other brother died in a shoot out. Her life embodies the importance to not think of progressive values as a fad. Being a martyr is appealing when it is not you or someone you love. Martyrs can be the heroes we admire and have all the super human qualities we can imagine. The downside is that too many of us think we could never be martyrs but if we are all going to die, then effectively we are all martyrs in a sense, provided we live a life of meaning and purpose. Like leaders before her, there will be a long standing debate as to who is best suited to carry on Bhutto’s dream. I just ask that when we think about our heroes and honoring their legacy, we should be very careful to make sure we support their ideas over their personality. And I know it’s cool to rock t-shirts of Che, Malcolm, MLK, and others but I have a new rule: You can’t wear apparel that features activists until you read their book(s) AND are doing something in your life to further their vision. Bhutto’s loss is very unfortunate but if you think democracy (or any other cause worth fighting for) was accomplished by one person, you are sadly mistaken and never use the term movement in your vocabulary. Condolences to family, friends, and supporters of the dream that is and life that was Benazir Bhutto. You can see my reaction to this here. This is a sad demonstration of the state of humanity in this world when disagreements become assassinations and when we forget that there are actual, real people behind all of these political debates.